It's two years until the 2020 Olympics, and so there's plenty of Olympic sports to talk about right now - golf, basketball and swimming among them. 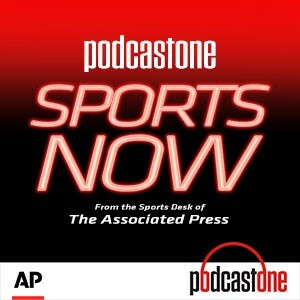 Guest host Tim Reynolds of The Associated Press talks to four-time Olympian Sue Bird about the state of the WNBA and her future plans, as well as has a chat with four-time Olympian Ryan Lochte about his latest turbulent chapter. Plus, Tim Dahlberg and AP Golf Writer Doug Ferguson wrap up the British Open, golf's third major of the year. Finally, we tell the tale of how an act of kindness by a now-departed football coach changed one kid's life. Tiger Woods' win at the Masters is still a hot topic. PodcastOne Sports Now hosts Jim Litke and Tim Dahlberg look back at the memorable moment that transcended the sports world. Litke and Dahlberg also discuss what Woods may do next for his career and the sport with AP Golf Writer Doug Ferguson, who was honored last week for receiving the PGA Lifetime Achievement Award in Journalism. Guest host Larry Lage catches up with Mike Tirico of NBC Sports after he filled in as an announcer at the Masters for Westwood One Radio. Jemele Hill, a staff writer for The Atlantic and host of "Jemele Hill is Unbothered," shares her thoughts on Woods' comeback and the essay Kyle Korver of the Utah Jazz recently wrote about white privilege for The Players' Tribune. ESPN analyst Chauncey Billups wraps up the weekly podcast, talking about his admiration for Woods. The 2004 NBA champion also breaks down the NBA playoffs, recalls being part of the infamous brawl involving the Detroit Pistons, Indiana Pacers and fans nearly 15 years ago and says he wants to be an NBA general manager. Hosts Jim Litke and Tim Dahlberg read the weather map, get a recap of Round 3 from AP golf writer Doug Ferguson and issue their forecast for a wild final round. Then major champions and TV analysts Curtis Strange and Paul Azinger recall what it's like to wake up with a chance to win a major championship. On the menu: Cold pizza and tequila. Valentino Dixon tells host Jim Litke and Tim Dahlberg the remarkable story of how his drawings of golf holes from a prison cell set in motion a lengthy process that overturned his wrongful conviction in a 1991 shooting. Also joining the interview is Golf Digest writer Max Adler, who advocated on Dixon's behalf. On the menu: Cocktails with two-time Masters champ Bernhard Langer. Golf guru Butch Harmon, caddie emeritus Carl Jackson and former winner Ian Woosnam weigh in on what makes a good Masters start. Then hosts Jim Litke and Tim Dahlberg recall a pilgrimage to the statue of Augusta native son James Brown. On the menu: single-malt scotch. Rick Reilly, author of "Commander in Cheat: How Golf Explains Trump," tells hosts Jim Like and Tim Dahlberg how he pulled the best-selling book together. Then the hosts review the men's and women's NCAA championship games and join AP golf writer Doug Ferguson on-site at Augusta National Golf Club for a sneak preview of the Masters. On the menu: Pastries? Bagels? Oatmeal? Grits? Eggs and sausage? Or all of the above? Hosts Jim Litke and Tim Dahlberg choose sides in the title game and remember the best college basketball teams that got derailed on their way to the coronation (1991 UNLV's Runnin' Rebels, anyone?) Then AP's Doug Feinberg previews the NCAA women's championship game from Tampa, and Aaron Beard takes a break from the Final Four in Minneapolis and hands over his list of best-nevers for debate. On the menu: How coffee got its groove on. March Madness Day 5: Who's Coddling Whom? Hosts Jim Litke and Tim Dahlberg debate whether a Final Four long on experienced teams and short on "one-and-done" stars signals a shift in the power dynamic between coaches and athletes. Then they're joined by AP sports writers Dave Skretta and Dave Campbell on-site for a preview of the games and how Minneapolis is rolling out the red carpet (and chain-link fences). On the menu: Where's the beef? Sportscaster Ernie Johnson takes hosts Jim Litke and Tim Dahlberg on a behind-the-scenes tour of the TBS studios during March Madness, then weighs in on the debate over Coach K's late-game play-calling in Duke's loss. Next, updates on the NCAA women's tournament from AP's Doug Feinberg and the NFL's (latest) instant replay tweak from pro football writer Barry Wilner. On the menu: Beer for breakfast. March Madness Day 4: Did He Ever Get Home for Dinner? Hosts Jim Litke and Tim Dahlberg put big-time coaches on the couch as the Final Four comes into focus, analyzing how the different approaches of guys like Coach K and Tom Izzo yield championship results. Next, they're joined by AP sports writers Stephen Whyno and Dave Skretta for previews of the day's big games. On the menu: That bottle of wine cost how much? ESPN analyst former NBA star Jalen Rose helps Jim Litke and Tim Dahlberg navigate the Sweet 16 bracket and hands out grades to the NBA-readiest prospects. Then the hosts play their own version of "College Bowl," arguing whether classroom smarts translate to the hardwood. On the menu: What do you call a 20-pack of individually wrapped hummus servings? Hummui?